Warm up this holiday season and boost immunity with this tangy spinach lime soup! Cumin adds a powerful punch to this recipe. It’s a great source of energy, vitamin A, C, E & B6, thiamine, riboflavin, niacin and vitamins and minerals like iron, manganese, copper, calcium, magnesium, phosphorous, and potassium. Consuming about one teaspoon of cumin daily can help you meet your daily nutrient requirements. The antioxidants have anti-carcinogenic properties too, and those found in cumin are particularly good for colon cancer prevention. The health benefits of fresh herbs are often overlooked; however, they can be just as essential to a healthy diet as fruits and vegetables thanks to their high antioxidant content. It’s not surprising that spinach is a powerful ally in the fight against cancer. 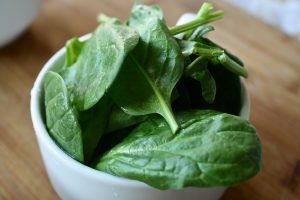 A number of studies have shown an inverse relationship between spinach consumption and almost every type of cancer. It’s the rich supply of vitamins, minerals, omega-3 fatty acids, antioxidants and phytonutrients that do the job. Folate also helps the body produce new cells while repairing DNA. 1. Over a medium heat bring the broth, cumin, and cayenne to a simmer in a heavy large saucepan. 8. Ladle into bowls and serve immediately.